Rabies - Rabies is a viral disease that infects the nervous system of mammals. It is transmitted through contact with the saliva of infected animals. It is 100% fatal. The first vaccine is given between 3 and 4 months of age, then boosterd once a year. It is very important to have your animals vaccinated for rabies to prevent disease in them, but also to help protect their human counterparts!!! DHPPL (Canine Distemper-Adenovirus type 2 Coronavirus- parainfluenza- parvovirus and leptospira)- The most relevent diseases in this geographic location are the distemper virus, parvovirus and leptospira-all of which can cause life threatening conditions in your dog. Parvovirus can cause severe bloody diarrhea that can be deadly to your dog. It is a tough virus that can survive in the environment for more than 6 months and can be brought to your pet on your shoes from a different location. Distemper (not related in any way to cat distemper) is another serious virus that your dog can contract from other dogs or raccoons. Canine distemper can cause respiratory, gastrointestinal, and nervous system problems. The DHPPL vaccine is given to dogs 6 weeks of age and older. The first vaccination should be boostered 1 month and again 2 months after initial vaccination. Occassionally we recommend boostering a 3rd time if the pet lives in a high risk area. The subsequent vaccinations are yearly. Bordetella Infrction- Canine infectious tracheobronchitis (kennel cough) commonly occurs in situations when many dogs with different homes come together in an enclosed space such as puppy class or a boarding kennel. The vaccine does not prevent infection but rather lessens the severity of symptoms and shortens the duration of illness. This vaccine is given to dogs aged 8 weeks or older. The first vaccination should be boostered 2-4 weeks later for maximum results. The subsequent vaccinations are yearly. FRCP- (Rhinotracheitis, calicivirus, panleukopenia and Chlamydia Psittaci) This vaccines aids in the prevention of the diseases commonly known as "Distemper" in cats. Given to cats 8 weeks and older. The first vaccination should be boostered 1 month and again 2 months after initial vaccination. The subsequent vaccinations are yearly. FIV/FeLV- Feline Immunodeficiency Virus is typically transmitted when an infected cat bites another cat; whereas, Feline Leukemia virus is often transmitted through common contact such as sharing food bowls or commensal grooming.Similar to AID/HIV, these viruses leave the cat with a very poor immune system and cancer like symptoms. 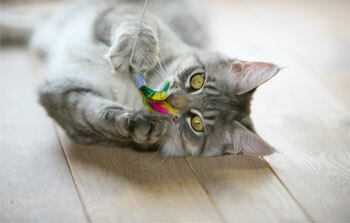 This vaccine is given to cats aged 8 weeks or older. The first vaccination should be boostered 2-4 weeks later for maximum results. The subsequent vaccinations are yearly.